Even today, highly specialized personnel supervise each stage in the production of every single machine, hand-crafted to order for each and every client. In this way, Giuseppe Bambi’s great experience and professional pride live on after over ninty years. advancements in equipment technology to its customers and in the industry. 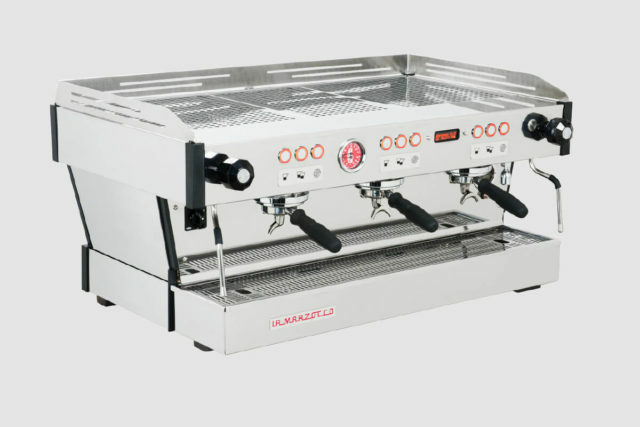 Originally named Officine Fratelli Bambi, La Marzocco is founded in 1927 by brothers and craftsmen, Giuseppe and Bruno Bambi, for the purpose of making their own brand of coffee machines. 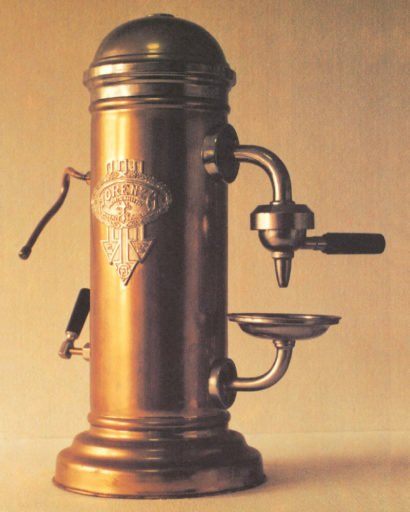 The first machine, the Fiorenza, was designed by and commissioned on behalf of Mr. Galletti, who later abandoned the designing of espresso coffee machines. Florence was consecrated, since the time of the Romans, to the god of war “Mars” whose name gradually evolved due to the popularization of the name, into “Marzocco”. With the advent of Christianity, the role of the defining city, traditionally attributed to “Marte”, was transformed into the heraldic symbol of the Lion, which became the iconographic symbol of the free republic of Florence and thus the name of “Marzocco”. 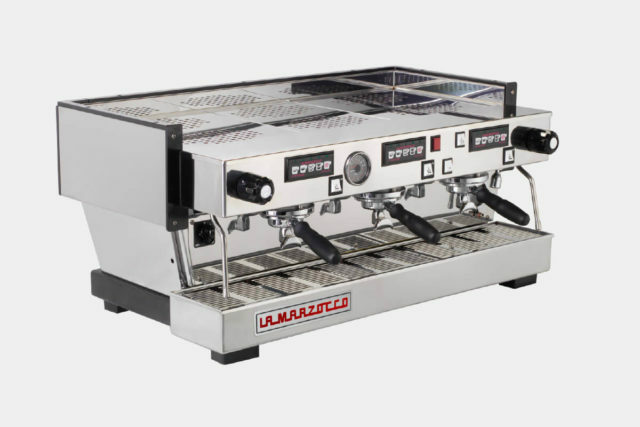 La Marzocco bears its name from the heraldic lion, sculpted by Donatello in 1418-1420. 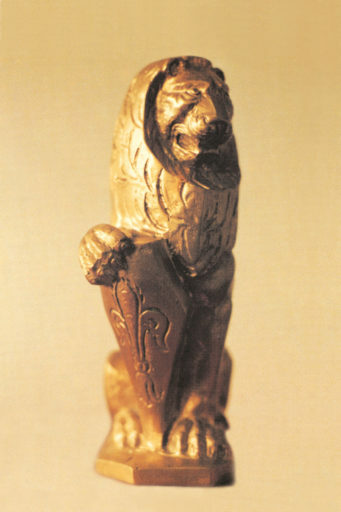 The lion is seated and with one paw supporting the coat-of-arms of Florence, il giglio, the lily. 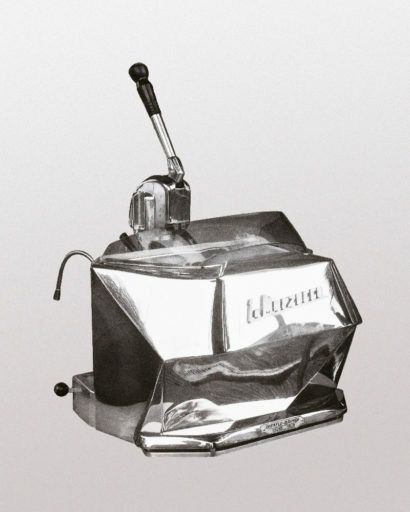 Just as the Marzocco statue represented the conquest of neighboring lands at the time of the Florentine Republic, the Marzocco would symbolize the company’s winning strategy every time a machine was designed, manufactured and sold. Indeed, at a time when few people drank coffee and even fewer shopkeepers were willing to invest in a machine for a beverage that could not be defined as popular, each sale was a success. 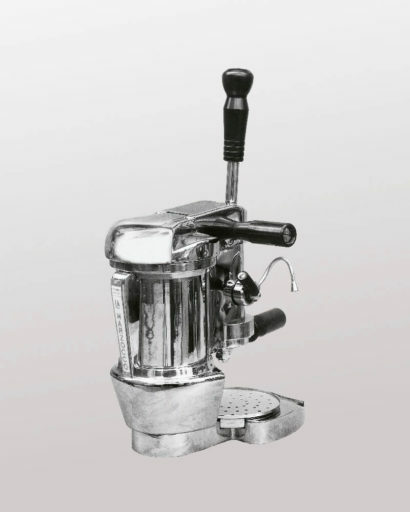 For this reason, Giuseppe and Bruno Bambi adopted the image of the Marzocco for the company, a symbol of victory and conquest, the symbol of Florence. 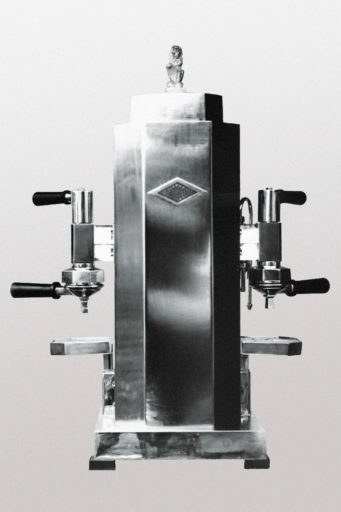 Designed and manufactured by Giuseppe Bambi for the first “La Marzocco” machine, with two groups and a vertical boiler. Polygonal body with 12 faces. 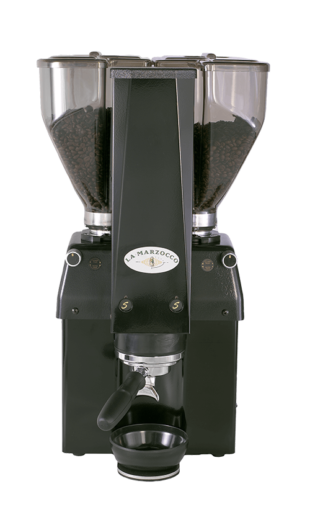 The upper cap bears the bronze-cast “Marzocco” symbol. 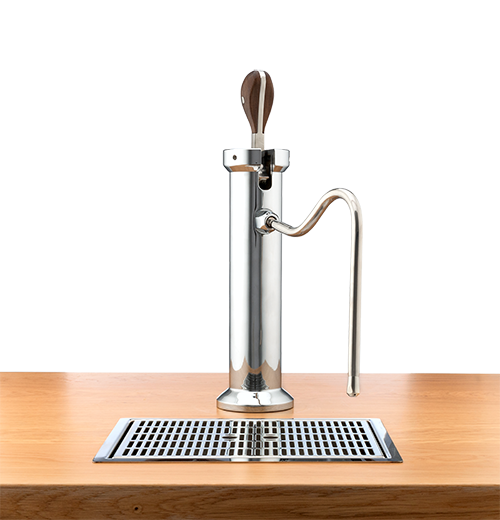 Functioning: hot water and steam pressure, generated by a vertical boiler, distributed on ground coffee by a 3-way tap. The tap, working by rotating a hand lever, was placed on the group’s body. 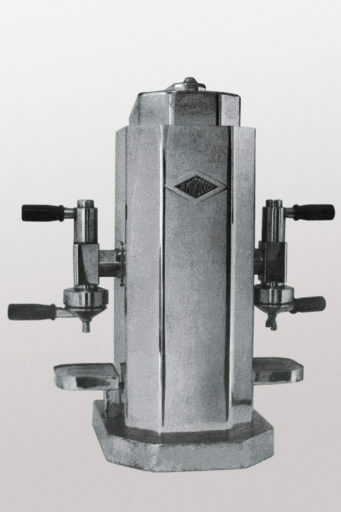 When the machine was not used, the tap allowed for the release of the pressure created in the filter-holder during coffee brewing. Four groups and a vertical boiler. Polygonal body with 12 faces. The upper cap bears the bronze-cast “Marzocco” symbol. Functioning: hot water and steam pressure, generated by a vertical boiler. With the arrival of Fascism, the consequent winds of change become reflective in decorative styles. 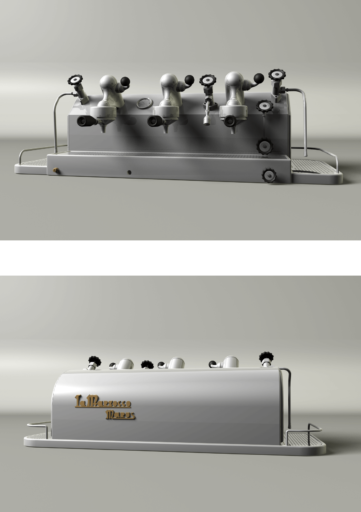 La Marzocco, while continuing to produce machines with a vertical boiler, begin to design machines with more linear and essential shapes. Two groups and a vertical boiler. Irregular polygonal body with 6 faces. 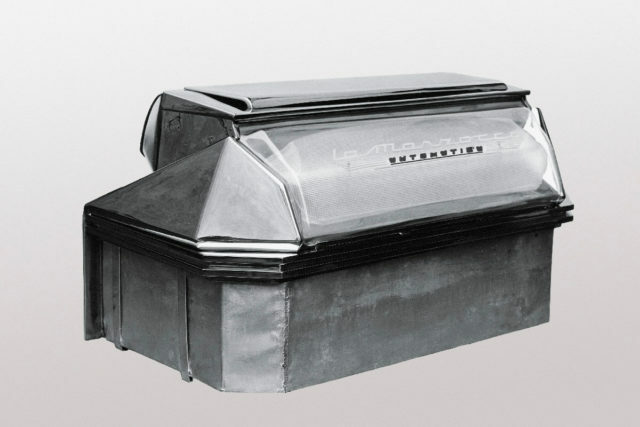 The “La Marzocco” vertical writing in cubiform letters and lion are on the upper cap. Functioning: hot water and steam pressure, generated by a vertical boiler. 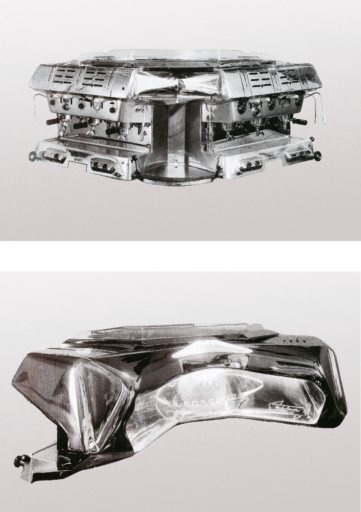 The group bodies were reshaped and suited to the aesthetics of the machine, which is more linear and conforms to the new style of design, which was much simpler in its drawing. Two groups and a vertical boiler. Irregular polygonal body with 6 faces and a square base. The upper cap bears the bronze-cast “Marzocco” symbol. Two groups and a vertical boiler. Square base. The upper cap bears the bronze-cast “Marzocco” symbol. Two groups and a vertical boiler. Irregular polygonal body with 6 faces. Functioning: hot water and steam pressure, generated by a vertical boiler which could be kept at a consistent temperature by means of an electric element, gas stove or charcoal stove. The lion was removed to allow for the “draught” of the coal stove from the upper cap. 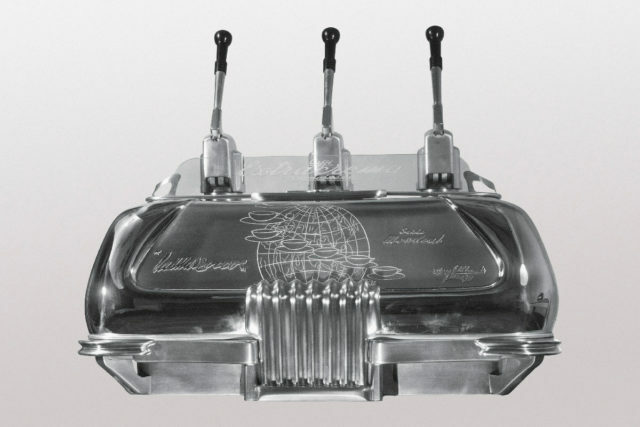 Subsequently, to make the lion less expensive (especially given the difficult pre-war times), a new aluminium-cast lion was designed and realized, and was stylized to suit the linear and essential body of the machine. Citrus fruit squeezer from the late 1930s. 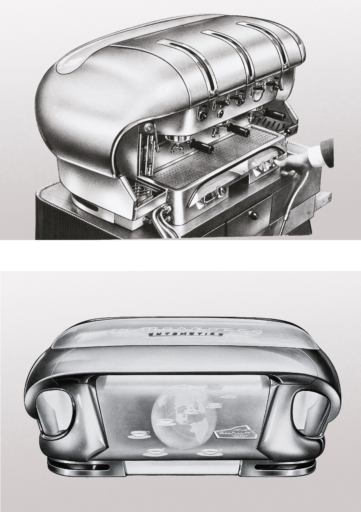 The Bambi brothers’ creativity extends beyond espresso coffee machines, to include – from time to time – the design and manufacture of equipment. 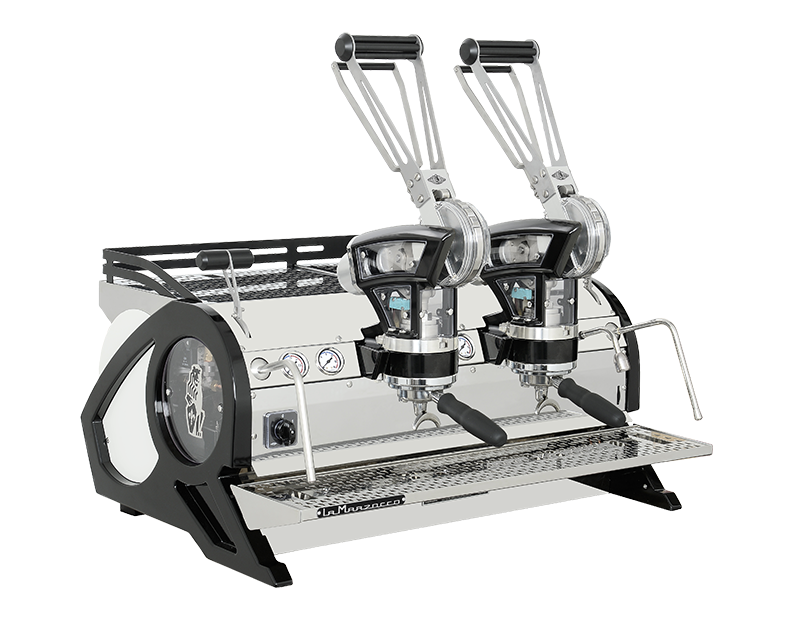 The growing consumption of espresso type coffee results in the need to simplify and improve machine design. 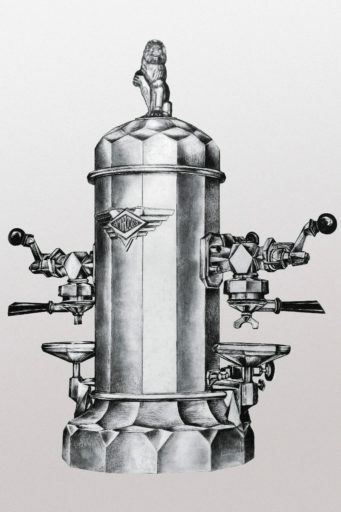 On February 25th, Giuseppe Bambi registers patent number 372525 for the first espresso coffee machine with a horizontal boiler. 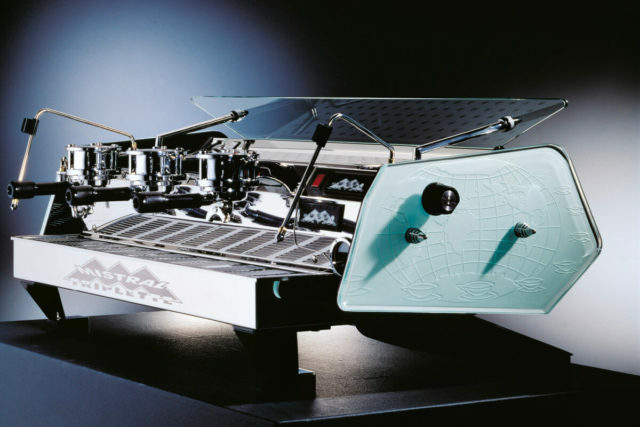 Unfortunately, while La Marzocco has no specimen or photos of this machine, the company archives hold the signed copy of the patent together with the original aluminium-cast blue-prints from which an image has been re-created. Designed by the Bambi brothers in the immediate aftermath of the Second World War. Functioning: pressure of hot water and steam generated by a horizontal boiler which had – by then – become commonly used by all manufacturers (the patent had been forfeited as it was not renewed because of the war). Notable technological development of the mechanical system of distribution of the 3 water tracts (water, steam and drain). 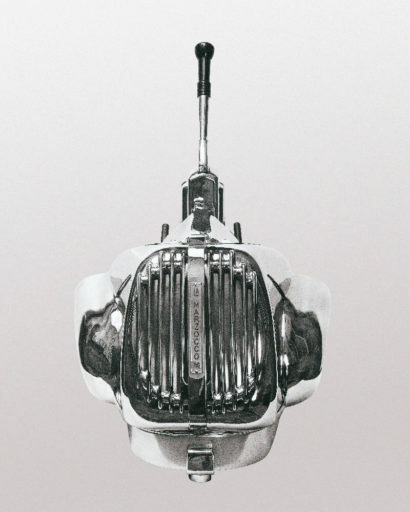 The mechanical valves were started by pushing two concentric buttons, which already had a very ergonomic design. Estimated production: 600-700 units (2, 3 and 4-groups). Designed for hotel restaurants. Designed by Giuseppe Bambi, this trolley makes it possible to serve coffee and after-dinner drinks, table side. 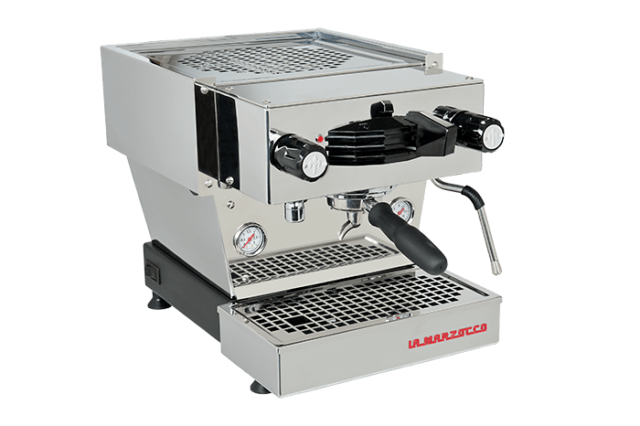 It was equipped with a La Marzocco 1-group Eureka series machine. Estimated production: Unfortunately, due to a poor marketing campaign, only a few units were produced. The idea, however, to brew espresso coffee directly before customers at their table was quite innovative. 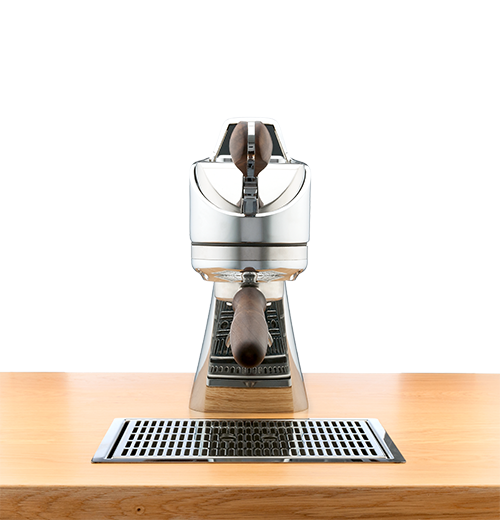 Functioning: La Marzocco introduces its version of the lever machine, which utilizes a spring that acts on a piston pressing water through the coffee at approximately 14 atmospheres. 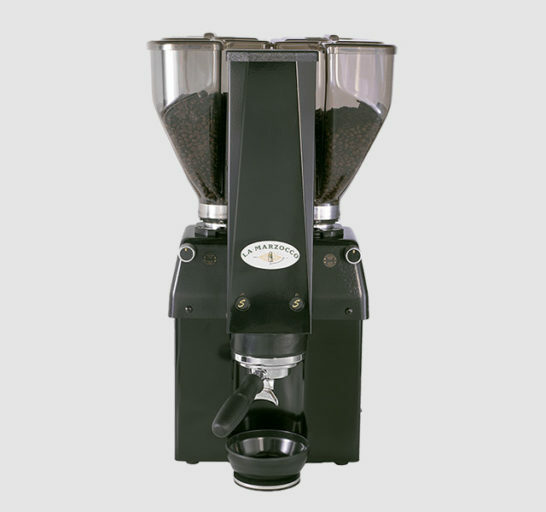 This changes the traditional system of the extraction of coffee, as well as the taste and, and in light of the pressure typical of lever machines, “crema” appears on top of the extracted espresso for the first time. Estimated production: 150-200 units (2-group). 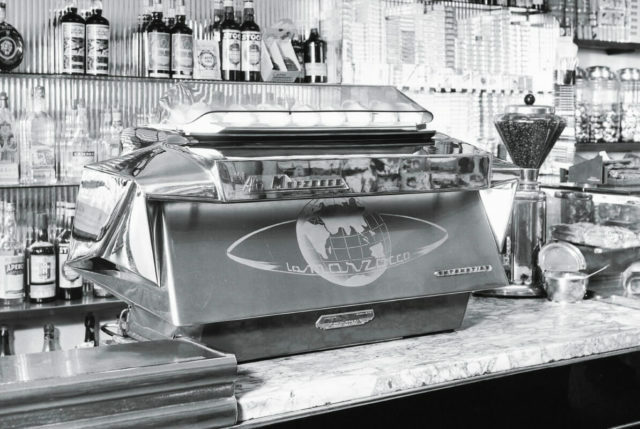 The Mondial represents the introduction of the globe logo, which is etched on the machine’s stainless steel body. The artwork is characterized by the diagonal “ring of coffee cups” that extend around the Earth. Estimated production: 100-150 units (3-group). Estimated production: 30-35 units (4-group). 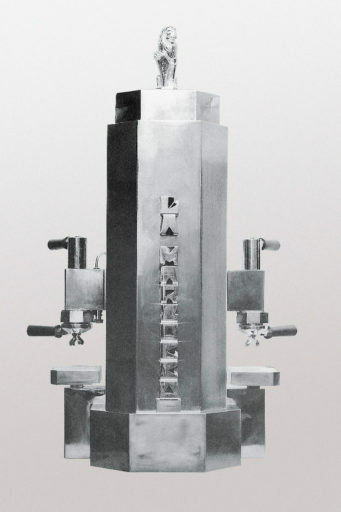 This 1-group machine was part of the first series of lever machines and was produced together with the 2, 3 and 4-group National and Mondial machines. The Rondine would soon be replaced by the Comet model, which was more suitable for standardized production. Estimated production: 400 units (over a 5-year period). 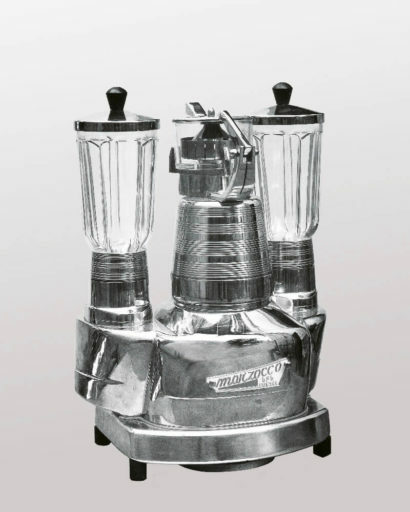 This extremely versatile accessory for bars was equipped with three motors and was one of the first mixers equipped with crystal glasses and stainless steel blades, at a time when mixers were made of glass and blades of brass. 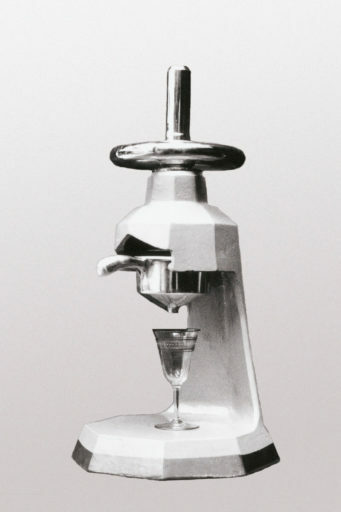 For this reason, it became known as the Hygenic Beverage Mixer. 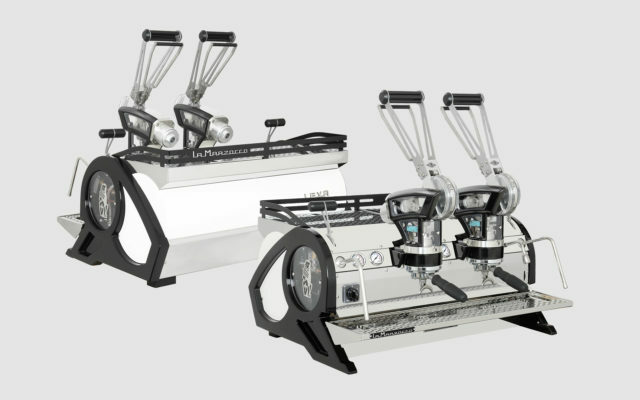 Functioning: La Marzocco creates an automatic hydro-compression machine. The Aurum automated the lever action. Connected to a ratiomotor started by an electric motor, the lever automatically lifted the piston, bringing the spring to the potential state. 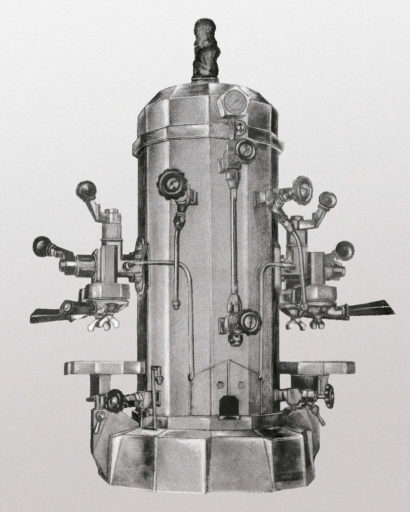 Simply put, the brewing-piston was lifted and pressed during brewing by means of a motor-driven piston whose surface was 6 times bigger and was started by the pressure of steam generated by the boiler (thus turning the 1.5 atmospheres of pressure inside the boiler to 9 atmospheres of pressure on the brewing piston). Functioning: automatic hydro-compression machine. 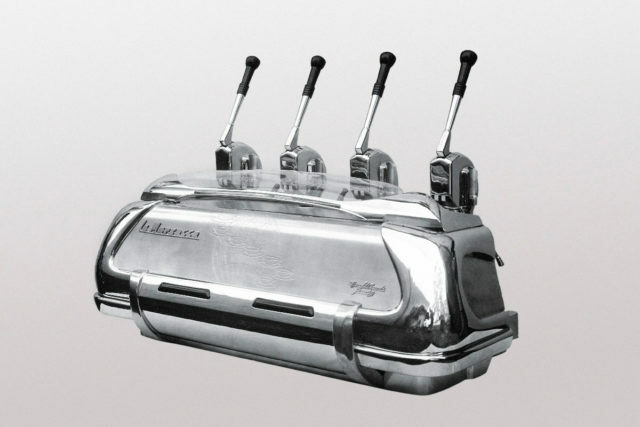 The Alba’s unique body, allowed it to be partially built into the bar counter so as to use its upper surface (the current cup-warmer) as a support on which to serve coffee to customers. Estimated production: 60-70 units (3 and 4-groups). 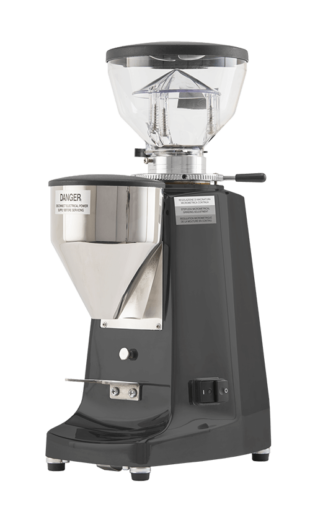 Functioning: espresso coffee grinder-doser which left practically no trace of coffee between the grinders or in the ground coffee container. With the Olimpia series, the globe logo evolves in design as the ring of coffee cups is replaced by the company’s name, “La Marzocco”. Estimated production: 300-450 units (2, 3 and 4-groups). Custom 6-group machine that was designed to be placed in a corner as if to “embrace clients”. Production: 1 unit. The 3+3 was installed in the Bar Bruzzichelli in Piazza Duomo, in Florence. 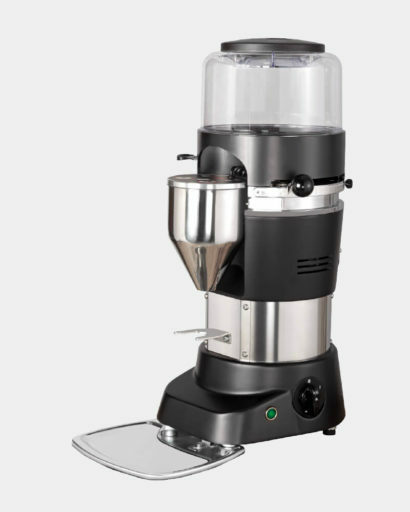 Also called the Micromarzocco, this espresso machine was designed for domestic use. Functioning: this lever machine was created with an electric heating element or made available for use with a “spirit stove”. Estimated production: 100 units (1-group). Estimated production: 500-600 units (2, 3 and 4-groups). Estimated production: 500 units (1-group). Estimated production: 1,600-1,800 units (1, 2, 3 and 4-groups). 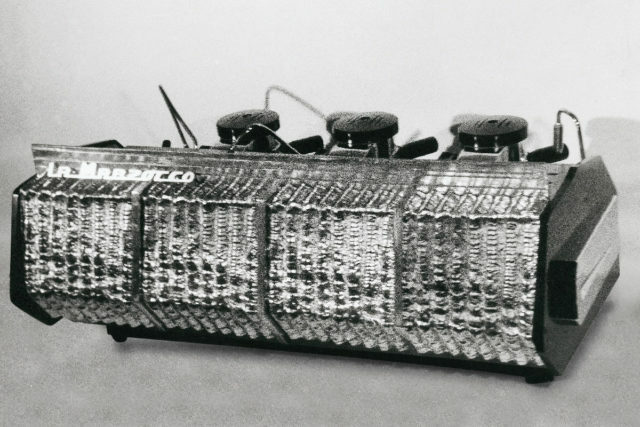 In 1968, Giuseppe Bambi’s Vulcano was awarded the Decorative and Industrial Arts Prize on occasion of the 14th Triennale di Milano exhibition. 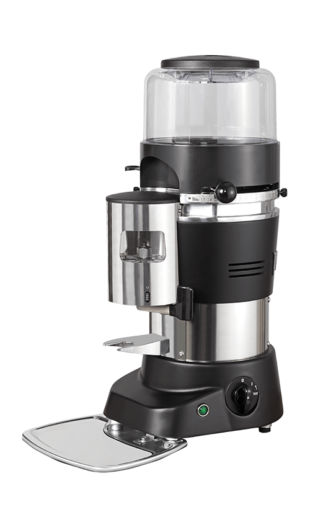 Functioning: espresso coffee grinder-doser featuring a micrometric grinding adjustment. 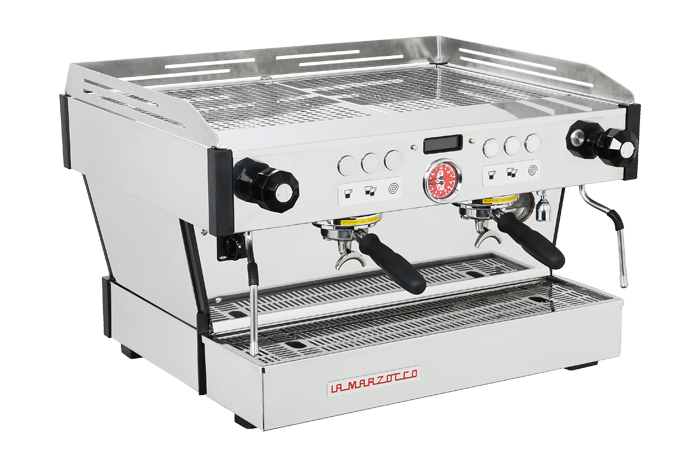 La Marzocco begins the production of the new GS series, which incorporates two important industry innovations: the use of independent boilers which isolate coffee brewing from steam and hot water production along with saturated groups. Both innovations vastly improve the thermo-stability of the machines. The letters “GS” stand for “gruppo saturo” or “saturated brewing groups”. While one boiler is used to generate hot water and steam (to make tea and froth milk), the other is dedicated to brewing espresso coffee. 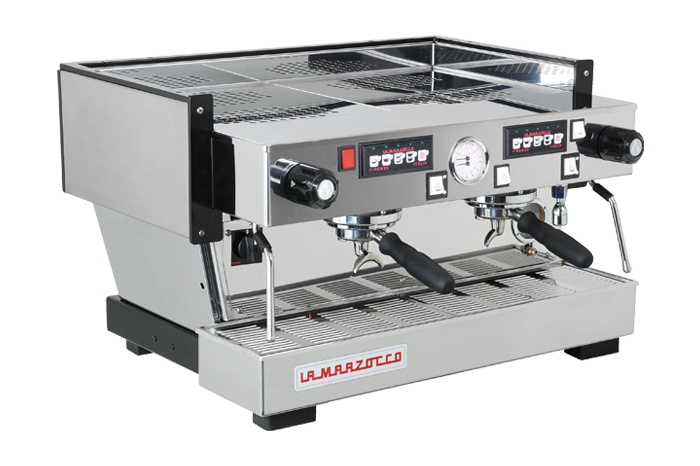 All La Marzocco equipment, from the introduction of the GS model, are equipped with the “dual” boiler and saturated brew group technology. Functioning: automatic hydro-compression machine. 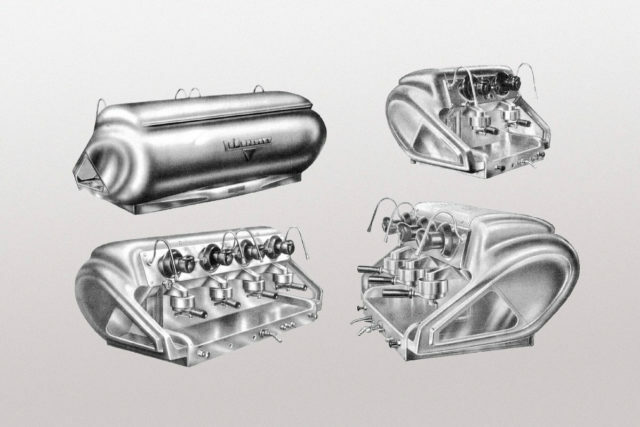 Different versions with different starting systems were later produced – both manual and with solenoid valves. In the latter case, brewing could take place by means of an on-off switch or could be controlled by a timer. Estimated production: 2,200-2,400 units (1, 2, 3 and 4-groups). With its front panel designed in bright Murano-glass, the GS Urania was built on the GS platform (2nd series). 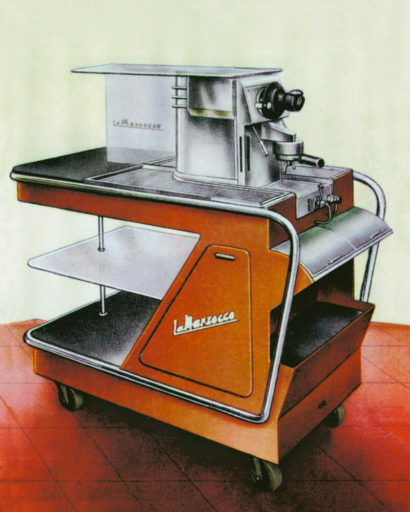 This machine, with its compact footprint (30x30x40cm), was the smallest machine produced by La Marzocco until 1980. 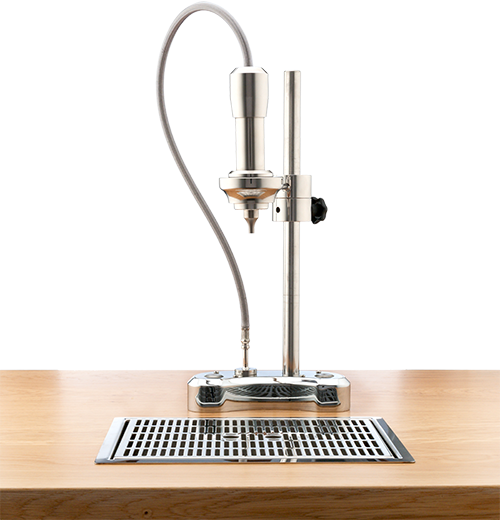 Functioning: equipped with two boilers and designed for semi-automatic (continuous) brewing only, it was created for counter surfaces with very limited depth. 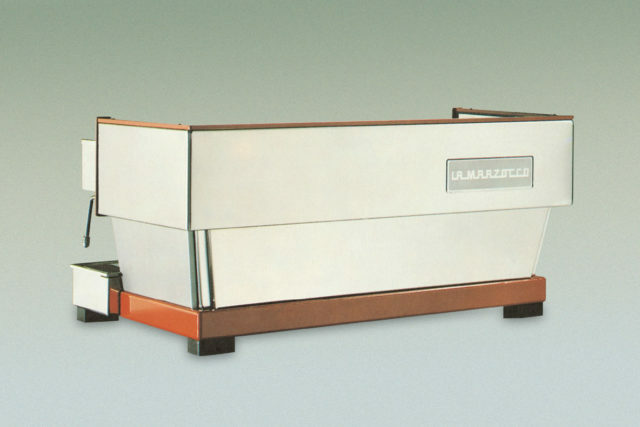 In the early 1980s, La Marzocco redesigned the body of the GS model. This led to the creation of the GS/2 series. The GS/2 functioned very similarly to the original GS. 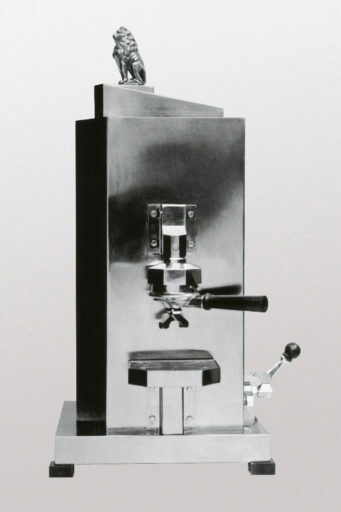 During the mid-1980s, automation became a key feature for traditional espresso machines, especially to regulate the quantity of brewed coffee in the cup. In fact, one early solution was to integrate timers in order to control the brewing time. 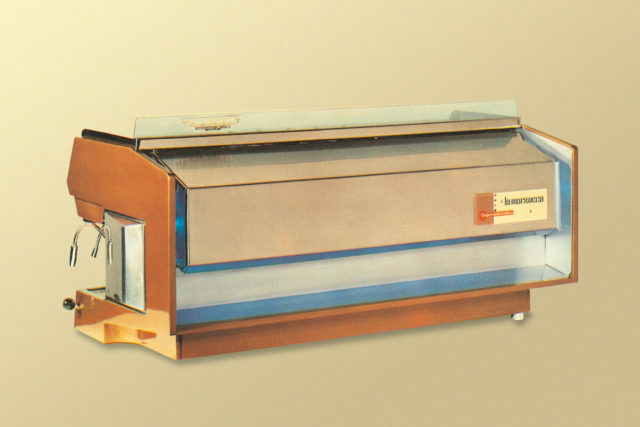 Part of the GS/2 series, the groups of this semi-automatic (continuous) machine were no longer exposed, rather they became covered and housed within the body. 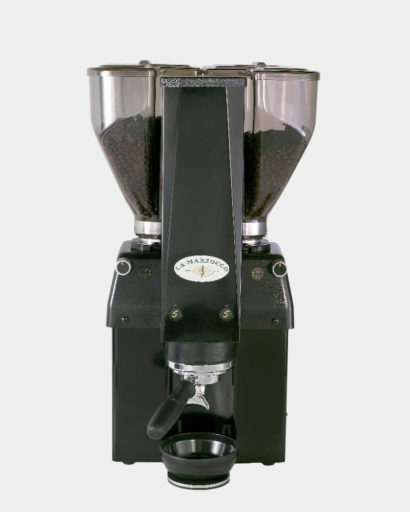 Different models were created, of which the last one paved the way for the volumetric dosage as opposed to automatically dosing brewed coffee with a timer. This machine featured a custom brass body and was produced using the same chasis and mechanical components used in the GS/2. Further to this, this limited edition model featured a spoiler that provided a second rack to store and warm porcelain cups. Production: 3 units, all manufactured for the same client in Florence. 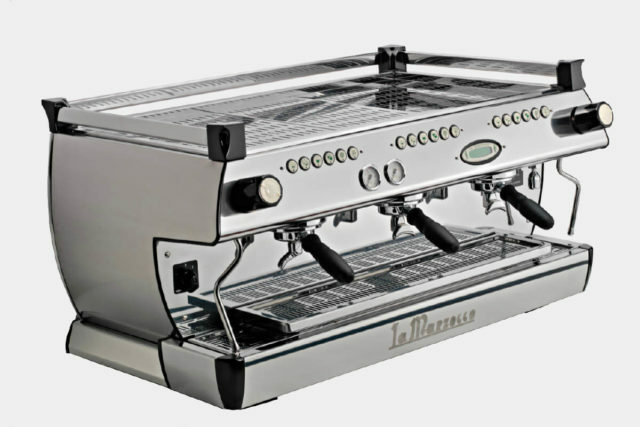 The Linea series of machines is introduced, including standard thermo-stability features with a classic stainless steel body design that remains popular today. The original series was made in stainless steel with a red colored frame. 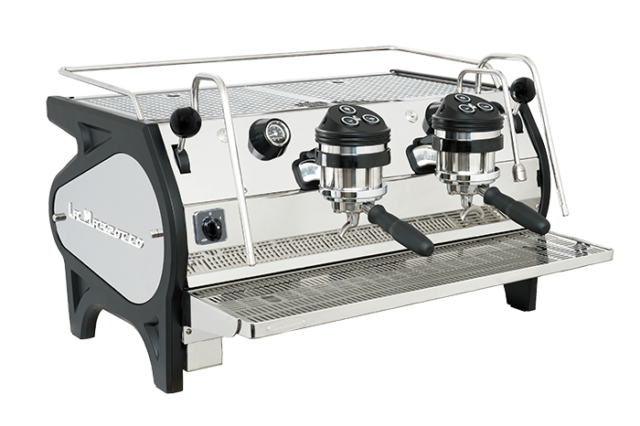 The Linea was built on the GS/2 platform, and was available with solenoid valves and on-off switches or with automatic volumetric dosing for brewed coffee. Estimated production: 1,200-1,500 units (1, 2, 3 and 4-groups). 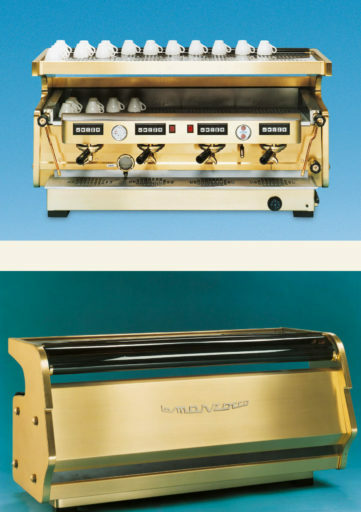 This machine featured a custom brass body and using the same chassis and mechanical components used in the Linea. Estimated production: 5 units (3-group) and 3 units (4-group) units, custom-made for a select group of important clients in Florence, Rome and abroad. 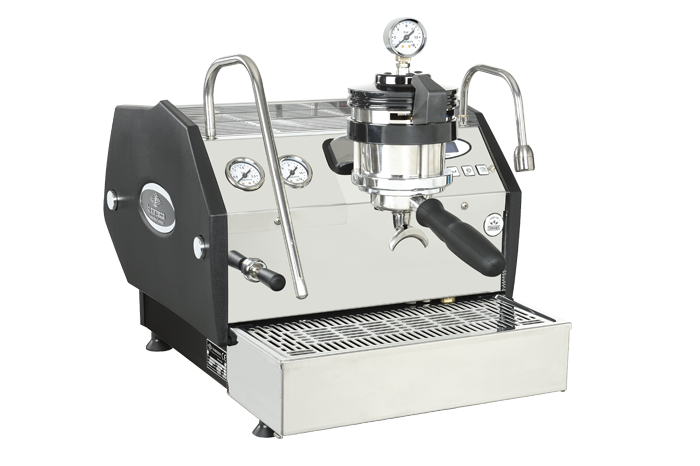 Designed like the original Linea, but with a black colored frame, the new version introduced a series of new components. Production: thousands of Lineas have been produced and sold around the world. 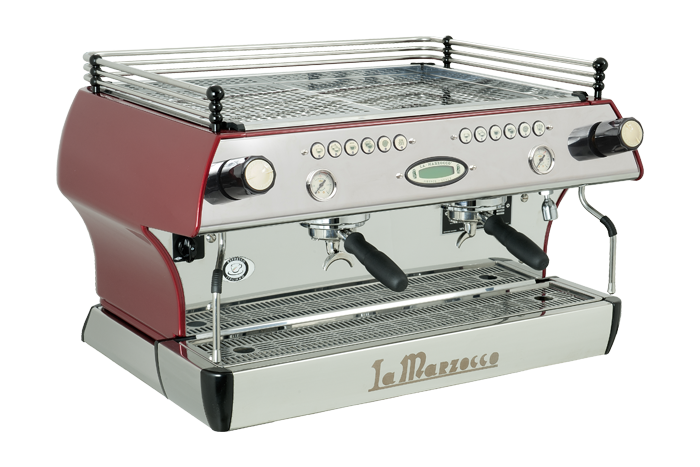 It is the Linea, more than any other model, which identifies the company and the La Marzocco brand. 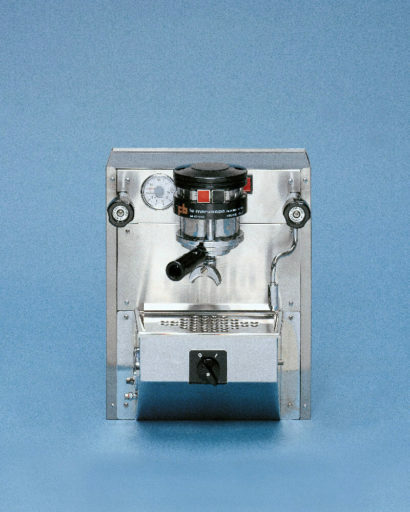 The Linea is still produced today. This machine was designed to be a modern version of the previous GS machine. 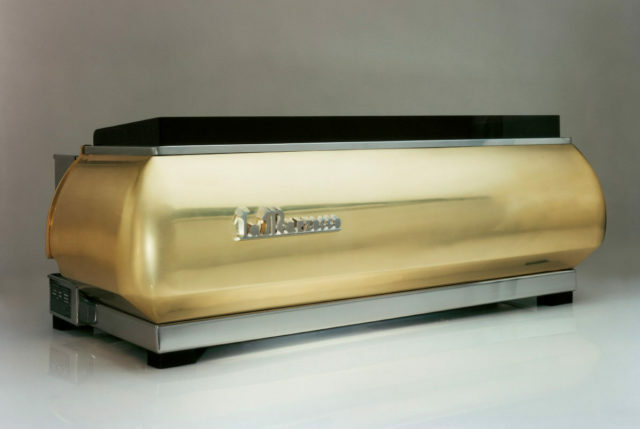 It was created by Dutch designer Kees Van Der Westen and introduced at the HOST Expo in Milan. 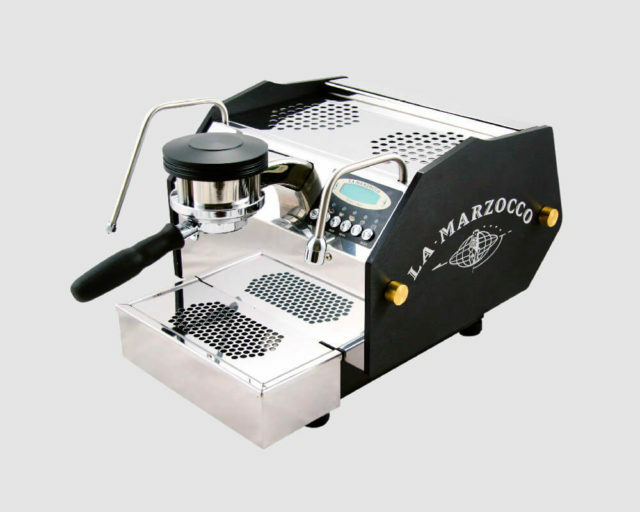 The La Marzocco logo was originally sand-blasted on the glass side panels. Functioning: same as the Linea. Production: 116 units. 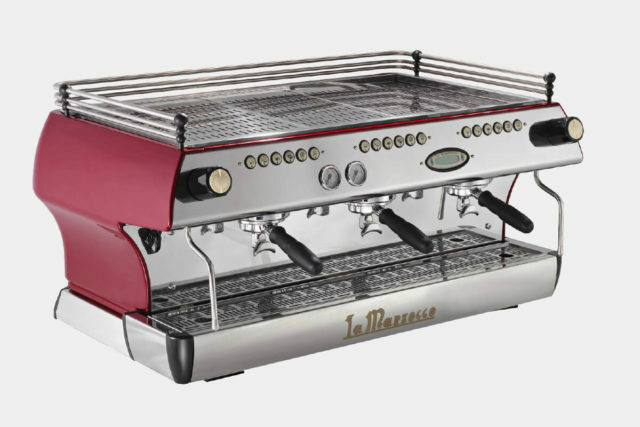 Celebrating La Marzocco’s 70th anniversary, a later version of the Linea, that is equipped with an elegant body that can be produced in virtually any colour, is introduced as the FB70. Production: thousands have been produced and sold around the world. 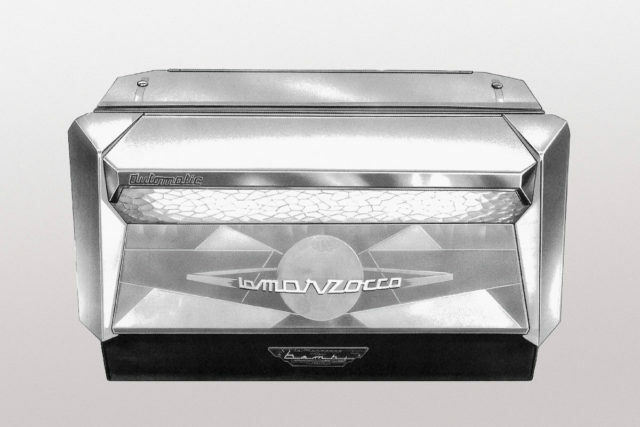 La Marzocco introduces the Swift grinder at the SCAA conference in San Francisco. This patented device is the first espresso grinder to incorporate direct grind and dosing into the portafilter along with automatic tamping. The Swift is awarded “Best New Product” of the conference. Production: a few thousand Swifts have been produced and sold around the world. 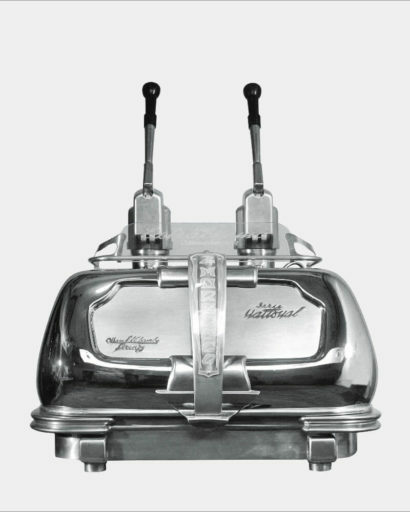 The Swift grinder is still produced today. 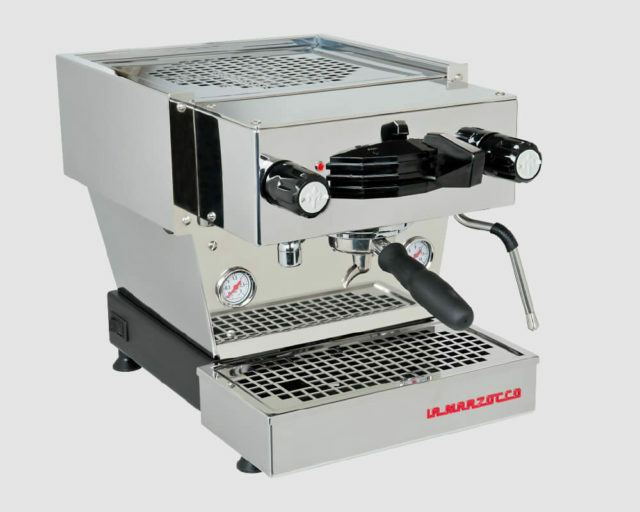 This new version of the previous machine model, is also designed by the famous designer Kees Van Der Westen, though it is manufactured at the La Marzocco factory. 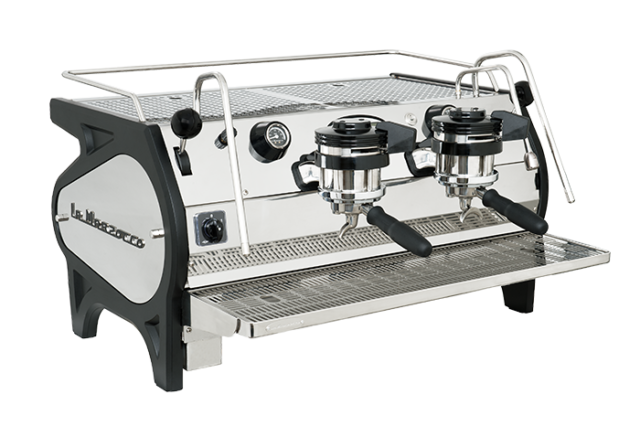 With respect to the previous model, the new version encompasses the technology of the FB80 and GB5, making the machine both unique in its design and representative of La Marzocco’s most sophisticated technology. 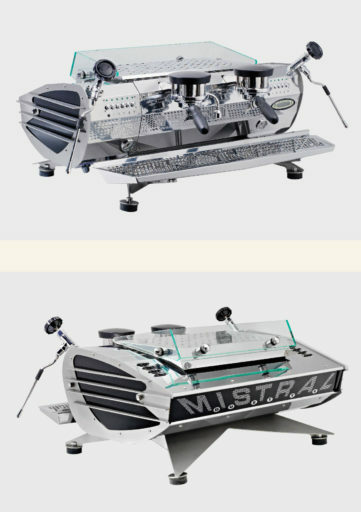 Production: The Mistral is manufactured upon client request only, a maximum of a couple of dozen a year with an open waiting list. 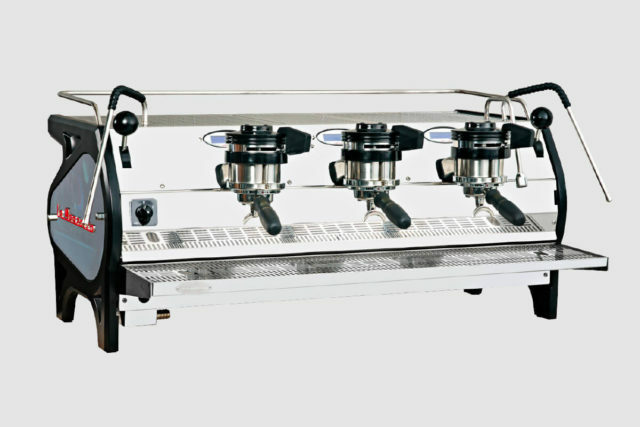 The GB5 is first introduced during the HOST Expo in Milano in 2005 and launched at the SCAA conference in Seattle. This model introduces more sophisticated electronics and improved thermo-stability, along with an updated stainless body, which was entirely designed by Piero Bambi. The GB5 is named after Piero’s wife, Giovanna Bambi. 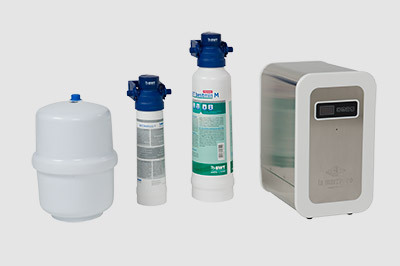 When compared to previous models, it includes many technological advances, among which a pre-heating system and PID (Proportional, Integral, Derivative). Production: thousands of GB5s have been produced and sold around the world. The GB5 is still produced today. 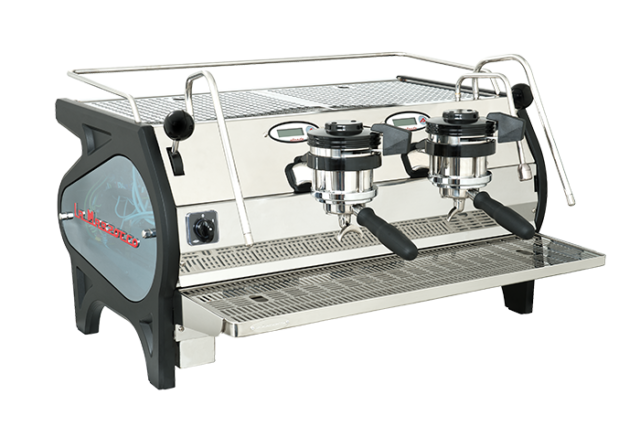 Manufacturing the first unit for the World Barista Championships Finals in Bern, the FB80 was designed by Piero Bambi. Equipped with a customizable panel, the FB80 was named to commemorate the company’s 80th anniversary. Production: thousands of FB80s have been produced and sold around the world. The FB80 is still produced today. The GS3 is introduced at the HOST Expo in Milan. 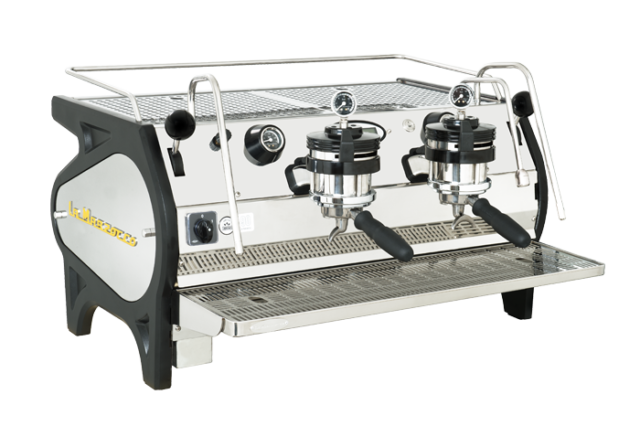 This compact machine, which aesthetically recalls the legendary GS series, features the same technology used in the GB5 and FB80. La Marzocco creates another industry first and launches the Strada with its pressure profiling technology on display in Atlanta at SCAA in April 2009. 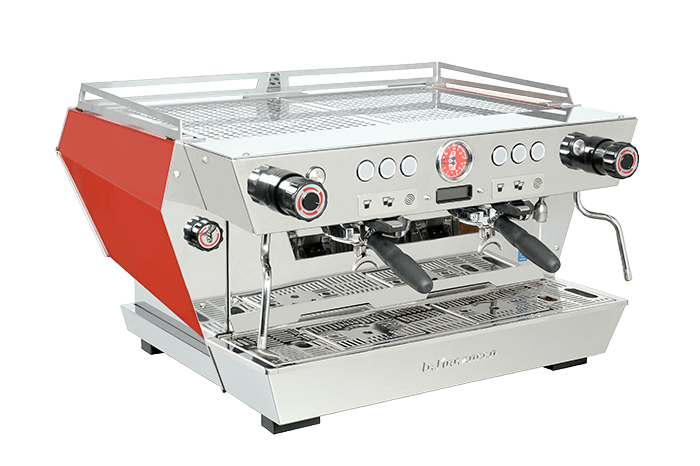 The Strada, whose design was also based on input by a team of experts in the industry, allows the barista, for the first time, to have absolute and direct control over pressure at any given point during an extraction. 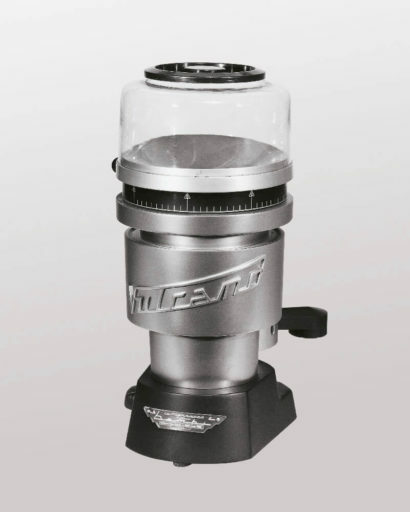 A new family of espresso coffee grinders that bring together La Marzocco’s distinct design with Mazzer technology. 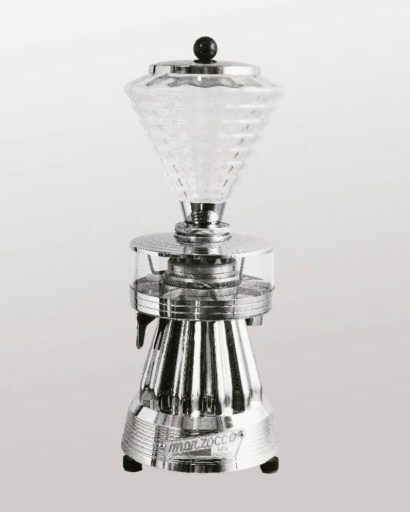 Piero Bambi took inspiration from his father’s original Vulcano grinder and carried it into the 21st century. 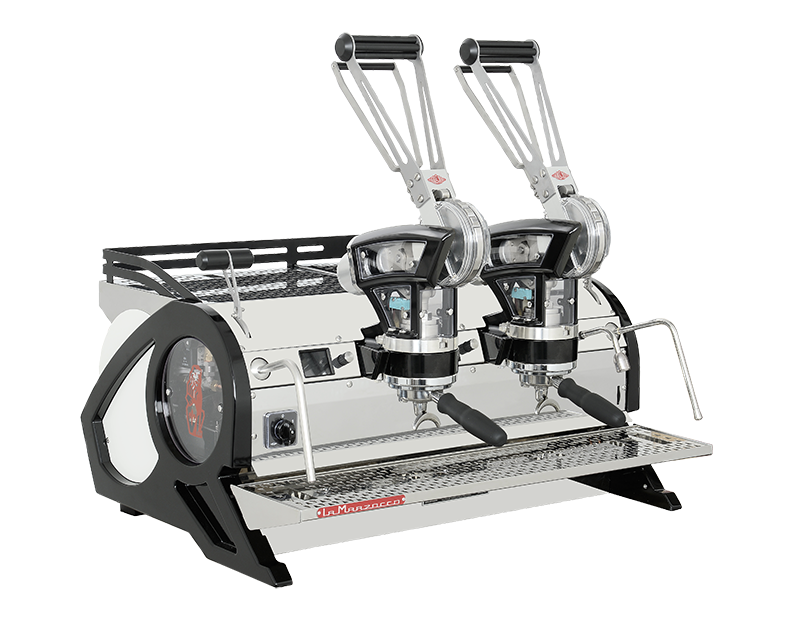 The Vulcano was introduced at La Marzocco’s first Out of the Box event in Milan in October 2009. 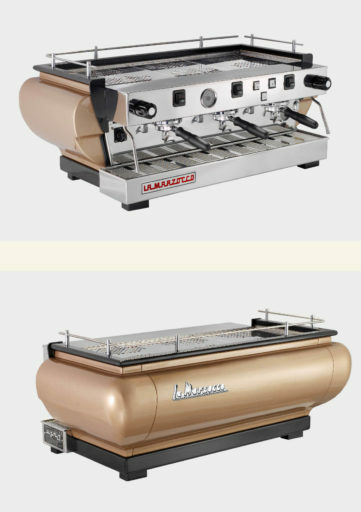 Designed by and named in recognition of Piero Bambi, the Linea PB is launched in the USA and London in the Spring. 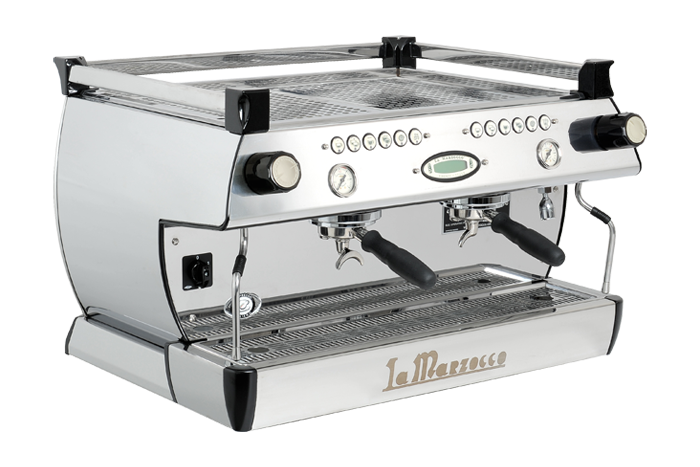 Reminiscent of the Linea Classic, the Linea PB features flexible, user-friendly, exclusive proprietary, interface software and related hardware ideated by La Marzocco. The company launches the Linea Mini for the home. 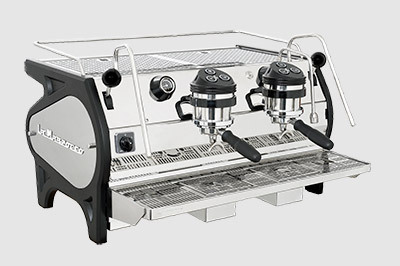 Born from the most iconic commercial espresso machine, the Linea Classic, the Linea Mini is equipped with a dual boiler, a pre-programmed pre-infusion feature and is optimised for the home in light of a built-in water reservoir, standard appliance power needs and its countertop footprint. Continuing to innovate, Auto Brew Ratio was also introduced in 2015. An option on the Linea PP, this patented scale technology enables the barista to program and dose based on weight. 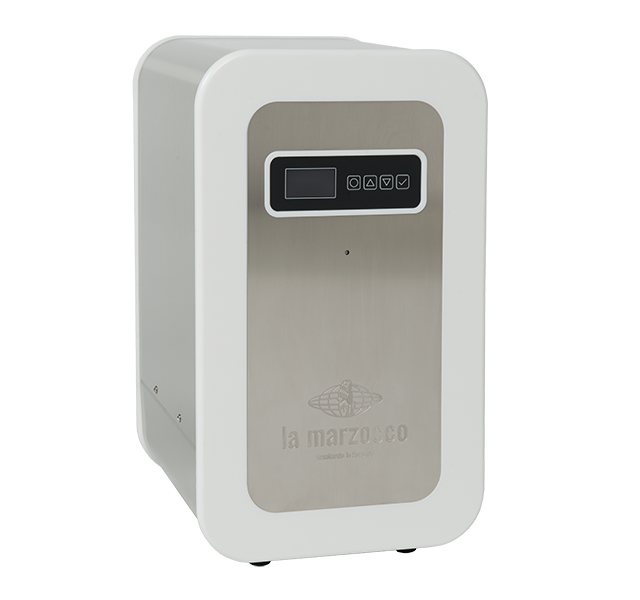 2015 brought La Marzocco Osmo, the Reverse Osmosis 3- stage treatment water system allowing one to brew a superior espresso and keep equipment in ideal working condition regardless of local water quality. 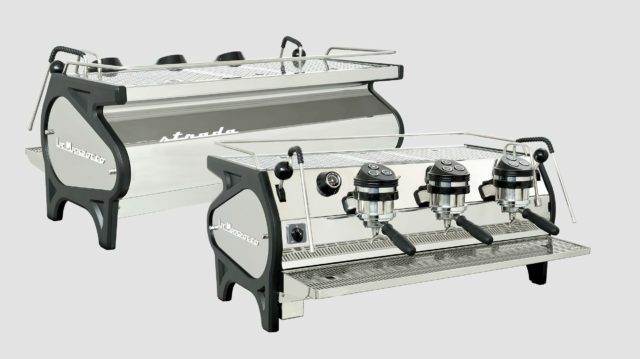 That year the Strada family was joined by the Strada AV, giving repeatability and familiarity in high-volume settings with barista friendly electronics which included a Performance Touch Steam Wand. 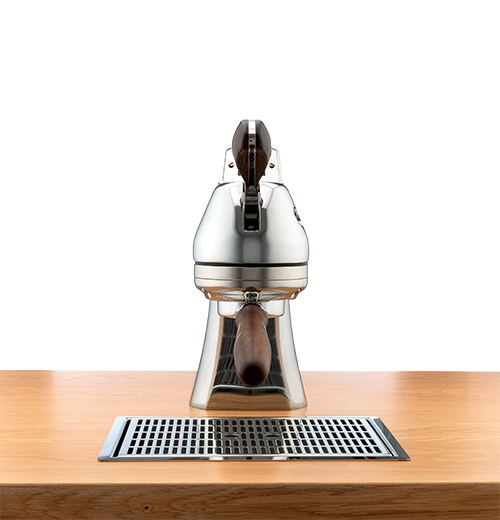 On La Marzocco’s 90th anniversary in 2017 the highly anticipated Leva, a ground-breaking model reinventing the technology and design of a lever-actuated espresso machine like never before, made its debut; first with an eye-catching 90th edition, later with the Leva X and Leva S models.